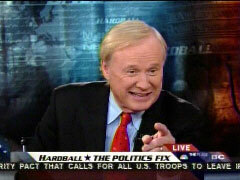 On Thursday night's "Hardball," Chris Matthews actually praised Sarah Palin for her ability to draw a crowd and even pegged her as the early frontrunner for the GOP nod in 2012, "Who’s gonna beat her?" However the MSNBC host, later admitted giving Palin that much credit took a lot out of him as he confessed to a guest panelist: "This is really hard to do this, to salute Sarah Palin." CHRIS MATTHEWS: As a student of politics, you guys are too, inevitably the man, in this case the woman, who gives that "Someday we'll win, we'll win this thing back again, even though we lost year," was Goldwater in ‘60, Reagan in ‘76. They all go to the convention, they give that crie de guerre, that call for, you know, call, war cry, and they all do it in the same way. "We're gonna lose this year but some day we're gonna come back." Goldwater came back and got the nomination, Reagan came back and got the nomination. Both from the right wing of the Republican Party. She could do it. ROGER SIMON, POLITICO: She could do it. MATTHEWS: And I mean it. MATTHEWS: Pawlenty? Who's gonna beat her? C'mon? Romney?! SIMON: -it is easier, it is easier to study up and get smarter than it is to not have a personality and try to get a personality. MATTHEWS: I'll tell ya, you know, liberals out there cannot stand her. Regular populist liberals cannot stand her. A lot of the middle of the road people can't stand her. But as long as you got an audience, look at that crowd! Anyway Roger Simon, Jill Zuckman, coming back. It's so hard isn't it Jill? This is really hard to do this, to salute Sarah Palin.